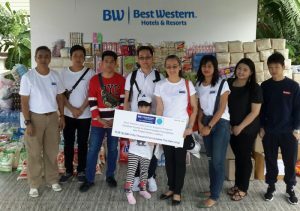 Lopburi (Thailand) – October 12, 2018 (travelindex) – Best Western Hotels and Resorts has continued to spread love and kindness across Asia with another successful charitable initiative to support under-privileged children in rural Thailand. This rewarding mission marks the latest in a series of CSR initiatives undertaken by Best Western in Asia. In the future, the company will continue to provide for local communities as part of its global “Best Western For A Better World” program, which supports charitable efforts and worthwhile causes all around the world.